Since this is going to be a “Classic CC” (re-run), I’ve got a Classic CC Clue for you. Thirded. Headlamp is a pop-up and that grillework is very distinctive. Headlights go up…headlights go down! My best guess is that they actually don’t go down. Under their own power, at least. I’ll eleventieth the Starion/Conquest, and will add 1981 as my guess. It looks like a Mitsubishi Starion. ’80s Honda Prelude or Integra? I don’t know, but the panel fit is impeccable. “Impeccable” – I do not think this word means what you think it means. I’m gonna go with Honda Prelude or Toyota Celica. Yeah, probably the Starion/Stallion, but just for kicks, this was my first guess: Bricklin SV1. How many cars were built with pop-up headlights? Might make for fun research. Damn! Tuned in late again! 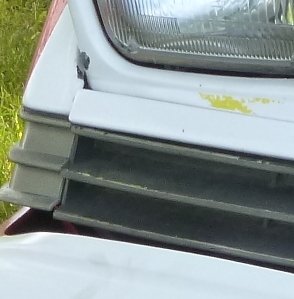 That pop-up headlight and the fluted “grille” mean only one thing: Mitsubishi Starion/Chrysler Conquest !! Heh, thats my car. Its a 1983 starion, and yes, I still have it.